Travelling News is the quarterly digital magazine edited by the Union of Belgian Journalists and Travel Writers. It is aimed at 10,000 addresses of the tourism branch represented in Belgium and surrounding countries and also at the touristic and cultural sector. Each number of Travelling News presents travel destinations, up-to-date touristic information, new publications, events and exhibitions of the sector. Travelling News is open to publicity. Companies and other institutions in the tourist business can contact the editor in chief via gilbertvictormenne@gmail.com. 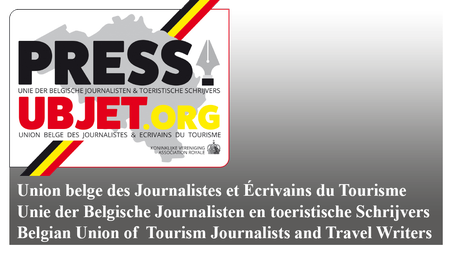 Together with France UBJET founded 1954 FIJET (Fédération Internationale des Journalistes et Ecrivains du Tourisme) ; it gathers 26 national associations and 600 members and it is recognized by UNESCO. According to its statutes the target groups for UBJET are journalists of the written and digital press, radio and tv journalists, writers, publishers of print and digital publications in which touristic articles are published, movie makers, producers of sound items, photographers and lecturers specialized in tourism. The members of UBJET must meet certain productivity requirements. All members have been invited to a survey on their recent activities. These files were carefully checked. The result of this action ensures all relevant interest groups in the tourism industry of the credibility of its members; they are listed on www.ubjet.org. Nowadays UBJET has 66 members, Dutch and French speaking. Since 1951 the magazine of UBJET informs the readers about travels and discoveries, and about the touristic events in Belgium and the rest of the world. Since the simple stenciled monthly “Nouvelles – Nieuws” and its successors “Jet-Info” and “UBJET-Info”, the magazine of UBJET has already covered a long way to the current digital “Travelling News”. This magazine is published four times a year, in March, June, September and December. About 10,000 e-mail addresses in the tourism and cultural sector in Belgium and neighboring countries receive the quarterly in their mailbox. The members-journalists travel all over the world. Now the Board of Directors of UBJET has decided to make Travelling News available starting from September 21 for everyone, and this free of charge. Are you interested? Just send a request to info@ubjet.org.